Years ago, I worked for a Christian audio magazine—a forerunner to podcasts, I suppose. At the time, the studio was transitioning between analogue and digital. Some interviews got edited digitally on the computer—the audible discards disappearing silently into the void—but mostly the editing still produced tangled snips of physical tape, curled on the studio floor like the remnants of a haircut. I was reminded of this as I wrote and edited Praying Together. Behind its 158 pages lies a pile of discarded snippets—some physical bits of paper and some existing only in my mind. Mostly, the book is decidedly better for what got left on the floor. But some of those tangled curls of thought just won’t be swept up and thrown away. They didn’t belong in the book, sure, but I’d like to think they belong somewhere. How do you pray online? Almost daily, I am asked to pray “with” others when I’m not actually with them. If you are in a church, it probably happens to you, too. In this digital age, we frequently receive prayer requests from people at a distance. They email us. They text us. They post on social media. Pray for my dad. He’s having surgery in 30 minutes. Prayers, please. I need to be at the airport in 10 and I can’t find my passport. I’m feeling so anxious today. Would you pray for me? At the crisis pregnancy center. Please pray for the couple I’m counseling. Praying for others is our great privilege. It’s a way to love our brothers and sisters and to bear their burdens, priorities so essential that the Bible equates these obligations with fulfilling the whole law of God (Rom. 13:8, Gal. 5:14). Praying for others is also a means of exhorting them, of reminding them of truth from God’s Word, and of lifting up their heads and pointing them to Christ. As they hear our confident and tender prayers, the suffering brother or sister will be encouraged. Online or in a text message, though, we tend to reply with a quick “Praying!” and click on. Sometimes, that's all we can do. And, it is certainly better than nothing. But in these situations, I think it is best to pray out loud online--to share the exact words that we are at that moment bringing before the Lord. We don't do this to show off our eloquence or piety. We do this because prayer is a means of strengthening one another's faith and encouraging one another with our love. First, it's good to say exactly who we are petitioning. Prayer is an activity of relationship—it is children talking to the Father whom they know and love. Not everyone understands this. Some people who see the social media post or receive the group text will mistakenly think prayer is nothing more than a good wish or a lucky charm. Out loud online prayers, then, affirm that true prayer is communication within an intimate relationship. We are praying to someone. And that someone is gracious and compassionate. Even other Christians often need to be reminded that the sovereign, loving, and holy God hears and answers our prayers. He is the same God who once healed the sick, released the prisoners, comforted the grieving, and gave bread and fish to the hungry. Most of all, he is the God who took his enemies (us!) and made them his friends. Knowing who we are praying to gives us confidence that he will hear and confidence that he does all of his holy will. Knowing that God has worked faithfully in similar situations gives us hope that he will act again. Praying to the One who healed ten men in one instant. . .
Praying to the God who made the borrowed axe-head float. . .
Praying to the Father who numbers the hairs of our heads. . .
Praying to the Lord who came to seek and save the lost. . .
Identifying exactly what we desire from the Lord will help us to evaluate whether it is something according to his revealed will and character. It will also help us to recognize his gracious answer when he gives it. And this, in turn, will allow us to give public thanks. . . .praying that he would heal you. . . .praying that he would allow you to find your missing object. . . .praying that he would reveal his love for you as you meditate on his Word. . . .praying that he would be at work in her soul. And then I close my eyes, bow my head, and bring that before the Lord. It may not be as good as standing shoulder-to-shoulder, together at the Throne with my needy friend, but it is something. One day we will be together there—and I trust that all of our prayers and all of his answers will be fully revealed to the glory of Christ. 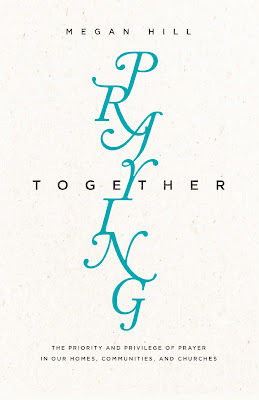 You can purchase Praying Together from Amazon, Crossway, The PCA Bookstore, Westminster Bookstore, or Christianbook.com. I have appreciated greatly the times that friends (like you!) have prayed online with me and sent me their prayers. I have been able to read those prayers repeatedly and received encouragement and often instruction to my perhaps confused and hurting heart. Now, may the God of peace, who brought up from the dead the great Shepherd of the sheep through the blood of the eternal covenant, even Jesus our Lord, equip us (His people) in every good thing to do His will, working in us that which is pleasing in His sight, through Jesus Christ, to whom be the glory forever and ever.